This special episode is a part of The 2014 Grimmys, Horrible Night’s game of the year awards. This show was recorded live on Twitch.tv/HorribleNight. Alright, 2014, you’re free to go now. 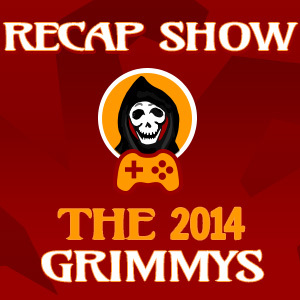 We hope all of you had as much fun with The 2014 Grimmys as we did in narrowing them down. Thank you for visiting and doing whatever it is you do with the content we have created. A big thanks to the Horrible Night Staff and friends who contributed to the awards. More importantly, thank you to our families and friends for supporting us during all of our gaming, writing, and podcasting in 2014 that led to this madness. Below you will find it all — the winners, the links to the awards themselves, and the podcasts where we made our selections. Subscribe and share what you like or just leave us a comment on what you thought about The Grimmys or your favorite gaming memories of 2014. We hope it leads all of you to some good gaming in the near future. Now, if you’ll excuse us, 2015 is already releasing games. Never enough time in the day for video games.